A centuries-old British specialty, Crosse & Blackwell Mincemeat is a rich, aromatic, ready-to-use fruit filling traditionally used in pies and desserts. 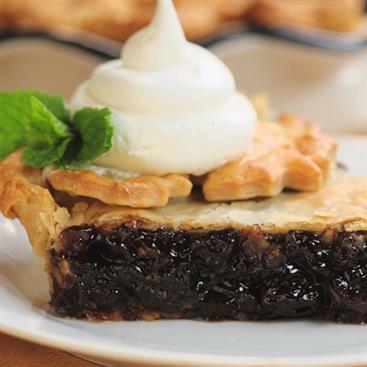 The Rum and Brandy version is made with raisins, spices and Pippin apples, a tart English heirloom apple with a signature flavor not found in modern apple varieties. Create delicious holiday desserts with the Original Mincemeat from Crosse and Blackwell. 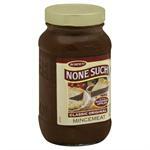 From traditional mincemeat pie, to Mincemeat Bars or Oatmeal Cookies, you can transform this jar of mincemeat into a new family favorite. Apples, Sugar, Water, Raisins, Distilled Vinegar, Corn Starch, Rum, Orange Peel, Sea Salt, Brandy, Spices, Orange Juice, Tapioca Syrup, Salt. 29 ounce jar. Guaranteed Fresh! Since 1706, Crosse & Blackwell® products have captured the exotic flavors, textures and aromas of the world’s most interesting cuisines. 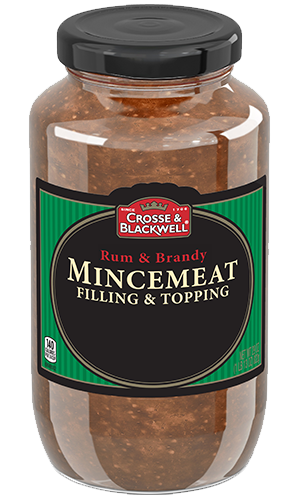 Crosse and Blackwell mincemeat products feature historic flavors connected to the culinary traditions of Great Britain. Since 1885, None Such has been making occasions special with its rich desserts. 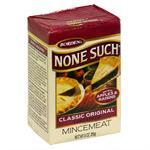 Of course there's grandmas mincemeat pie which has become a family tradition around the holidays. Borden's Classic Mincemeat pie filling made even more delicious with the addition of Rum and Brandy flavors. Ready to eat pie filling, 27 ounce jar.